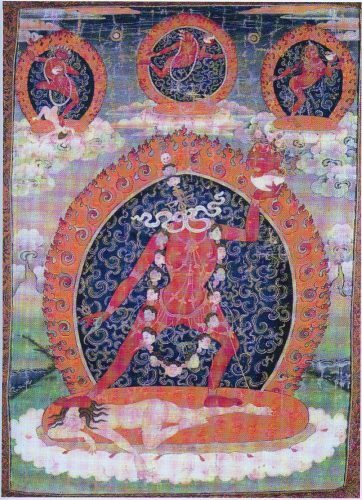 Rinpoche had a commissioned a series of thangkas and amongst them was one that depicted Dorje Neljorma Uchedma – the severed head goddess. She is an awe-inspiring figure who graphically decapitates herself only to release three jets of blood that falls into her own mouth as well as two other attendant figures. Rinpoche called for a gathering of students to explain the significance of such a graphic figure. The iconography of deities like the stance and the color of their skin represent the ‘activity’ and the delusion they primarily counter. Rinpoche gave the example of Green Tara, who is in the sitting posture with one leg in full meditation while her other leg is outstretched and pendant. This is like someone who is sitting but has one leg positioned in such a way that it would be easier to stand. This denotes that her general activity is more peaceful but her pendant leg represents her ever ready to assist and her swiftness in coming to aid her devotee. Vajrayogini Naro Kechari on the other hand is in the ‘warrior’ stance, with one leg bent and the other outstretched. This means that she is poised and lie in wait to do battle with our delusions and negative karma. On the other hand, the colors of the deities generally represent a particular delusion that the deities counter. The example was once again Tara, whose green-hued skin represented that her practice counters jealousy. Vajrayogini with her bright coral-hued skin represent that she counters desire. The practice of these deities usually targets one particular delusion as means of eradicating all other delusions. Therefore, the eradication of that one delusion is like a doorway for the deity to gain access to the entire house, representing all other delusions. Hence, Rinpoche went on to talk about the Severed Head Vajrayogini. The main symbolism of the headless Vajrayogini is not about non-attachment to the body as someone in the audience suggested. It is about the clean and complete removal of the grasping and self-identification of the ‘I’ – the ego. Generally, our self-identity is strongly associated with our face more than any part of our body. 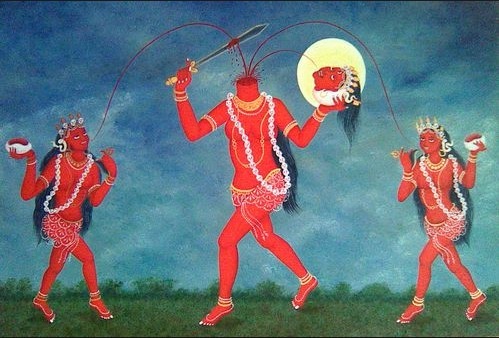 Hence, Vajrayogini uses her ritual chopper and decapitates herself and this is symbolic that her practice eradicates the ego. Contrary to what some people may think, the eradication of the self does not destroy our individualism, personality or makes us into a mindless person. In fact, the eradication of the ego makes us become a vibrant, compassionate and one with greater awareness of the suffering of others. In other words, we become much kinder, forgiving, tolerant, conscientious, generous, contemplative and we are just basically a joy to be with. Rinpoche then went on the define delusion, which is NOT seeing things as they are but on how we perceive circumstances and situations. We perceive the world we live in base on a lens of our past experiences and so, we react based on this lens. All of us have this lens, which is formed during our formative years and sometimes they can be based on experiences from a previous life in the form of imprints. Whatever it is, the circumstances have changed but our perception of it has not and we are deeply ingrained with it. Rinpoche gave the example of how some of us go into a negative reaction when another person raises their voice. Probably in the past, a shout or a scream was attributed to a scolding or something negative. In the present as adults, they shudder or go into some form of negative reaction almost immediately without thinking. However circumstances have changed and sometimes a raised voice does not necessarily mean something negative, it could be the fact that someone is passionate but the raised voice would automatically elicit a negative response. Rinpoche went on the call delusions as a mental construct that we all generally live by. It is due to this mental construct that we are attached to certain situations and people and averse to the other type of situations and people. He said that if we contemplate deeply the actions that we do the whole day, we are governed by our attachments and aversions. It is this ‘pull and push’ that in turn fuels our attachments and aversions. We end up creating more and more negative karma that keep us trapped in our present circumstance and ultimately, leads us to take rebirth in a worse-off circumstance. Planting of seeds. For many who lack the karma to practice the Dharma will only manage to plant seeds. Rinpoche said he can only plant Dharmic seeds in his dogs, spirits and local deities of the area. Rinpoche also mentioned that this the function of the Gyenze chapel, to implant seeds and we can continuously implant more seeds as we practice the Dharma. Opening of seeds. For many who enter the Dharma, the seeds are opened to practice the Dharma for a few months and then they leave, some for a few years and they leave and some would have enough strong enough seeds that would lasts a whole lifetime. All is dependant on the karma and merits of the person. Germination of the Seeds. This when we actually realize the Dharma and transform. When we had actually generated enough merits to sustain our transformation and we apply the teachings, it would change the course of our lives and future lives. 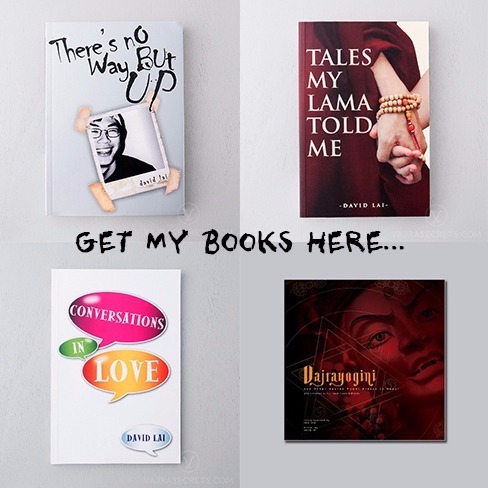 The Severed Head Vajrayogini removes all of these mental constructs by removing the root cause of all mental constructs, the identification of the self – the ego. We are attached and averse to people and circumstances because we have an ego to please, gratify and protect. However in the grander scheme of things, this self-identification of the ‘I’ is illusory and does not really exist. Hence, Vajravogogini reveals this with the dramatic decapitation of her head and is still able to live and function. She does this not by divine powers of a Buddha but by direct perception of emptiness and egolessness. The Severed Head Goddess is attended by two other attendants and from the trunk of her neck, there are three severed blood vessels spurting three jets of blood that flowed into the mouths of her own decapitated head that she carries in her left hand and her two attendants. Rinpoche explained that this represents that her practice purifies the three psychic poisons of ignorance, hatred and desire and this leads to the attainment of the three bodies of a Buddha – emanation body, enjoyment body and truth body. In other words, the severance of the ego via her tantric path would lead to the purification of all delusions and ultimately, the attainment of Buddhahood itself. The lineage of this practice stems from the Mad Princess Mahasiddha Laksminkara according to Taranatha’s Rinjung Gyatsa collection of practices and sadhanas. Her sadhana is also included within the Rinjung Lhantab by the 7th Panchen Lama Tenpai Nyima (also numbered as the 4th). She is also included as one of the practices within the old biographies of Krsnacharya and the two sister mahasiddhas, Mekhala and Kanakhala. However, there are no present lineages that traces to these mahasiddhas, which meant that these lineages did not survive. At this point, Rinpoche showed us a part of the thangka that depicted a charnel ground with a yogi engaged in his tantric meditative practices while blowing a thighbone trumpet and damaru – hand drum. 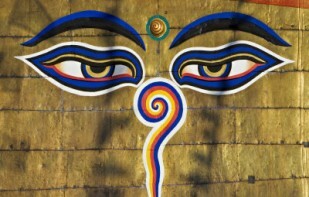 This represents the ideal location for tantric practice in Tibet and India. A tantric yogi instead of adorning the body with perfume and nice clothes takes the ashes of the deceased and smears his entire body in abandonment of the senses. Then, he proceeds to the charnel ground and sits on top of a corpse and does his practice. 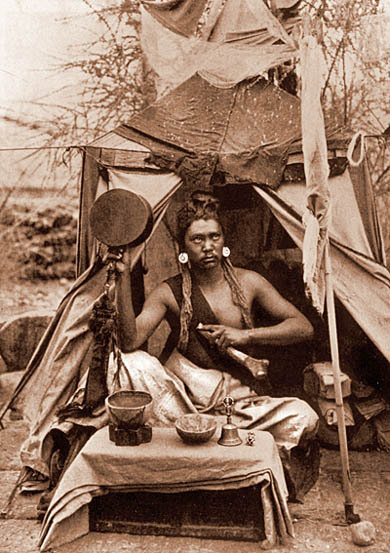 He has a damaru hand drum and skullcup filled with sacred inner offering. In India and Tibet, charnel grounds are unlike its modern equivalent of neatly manicured cemeteries that we have today. It is a frightening place with dead bodies lying all over and with the deceased chopped up and ready to be fed to the vultures. It is also a place haunted with the spirits of the deceased, many of whom are very attached to the former bodies. This is coupled with the energy of the charnel ground where countless family members, loved ones and friends of the deceased have come to mourn. This adds to the negative energy of the place. It is precisely for this reason that the charnel ground is the ideal place to practice according to old tantric tradition. In this place, our ego is brought to the forefront because we are in a state of fear. When our ego is brought to fore, it can be work on and eliminated by our practice. If we look deeply, we are frightened in such places because of our self-preservation of our ego. If we have real refuge or we hold on to our vows, nothing can harm us. Hence, tantric practices like the Severed Head Vajrayogini are excellent to be practice under such conditions. Rinpoche said that this tradition of meditating in the charnel ground is still being practiced especially in Tibet. Furthermore, it is also practiced in other Buddhist traditions like in Thailand, where monks meditate on bones. The underlying reason beneath all of this is the development of deep renunciation in our practice in order for it to be successful. Rinpoche said that some lamas do not need to physically be in the charnel ground but can transport his mind there and live in total renunciation. The Severed Head Vajrayogini is not a major Vajrayogini lineage today but it continues to capture the imagination as she did in ancient India. Hence, she is one of the few Buddhist deities that were appropriated into the Hindu pantheon, where she is known as Chhinnamasta, one of the ten Mahavidhya goddesses. Nevertheless, most scholars agree that her worship originated within the Buddhist context. To this day, there are number active temples in India dedicated to Chhinnamasta where her worship in the Hindu tradition is still very much alive. Thank you for such a well written piece. It captures the essence of the teachings and is easy to understand. I particularly like how you described the significance of the iconography as most people would think it’s such a bizarre image. Knowing the symbolism behind it helps us understand why this particular Buddha is efficacious in countering our big fat ego. Thank you Pastor David for this sharing .